Jobu welcomes Bryce Harper to his future Hall of Fame career. I don’t have too much to say about Bryce Harper, but I felt the need to weigh in on him anyway, just because he’s one of, if not the, hot button topics in baseball right now. For those of you who don’t follow baseball, shame on you. You’re ridiculous. However, I will tell you who Bryce is and why everyone is up in arms about this 19-year old kid from Sin City. Harper has been a bit of a controversial figure since his sophomore year of high school, when he dropped out and obtained his GED so that he could enter the MLB amateur draft a year early. I’m not sure if anyone else had ever done this before, but I hadn’t heard of any such thing. 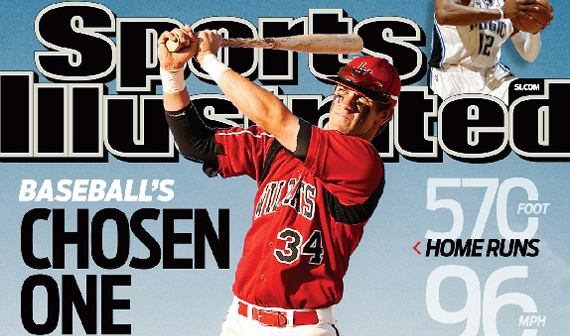 To kill time before the draft, Harper enrolled at the College of Southwestern Nevada, where he hit .443 and set the school home run record with 31 bombs (according to wikipedia). It was no shock when, later that year, the Washington Nationals made him the first overall pick in the draft. From there, Harper went to the Nationals Fall Instructional League, and eventually became the second youngest player to play in the Arizona Fall League. He split 2011 between the Nationals’ A and AA affiliates, hitting .297 with 17 HR, 58 RBI and 26 SB in 109 games. This spring, rumors ran rampant that the Nationals might let him skip AAA and start the season with the big club, but he ended up getting sent down to AAA Syracuse to start the year. That didn’t last long. Injuries and the need for offense helped the Nationals decide to punch Harper’s ticket to the majors this past weekend, and he arrived with much fanfare. 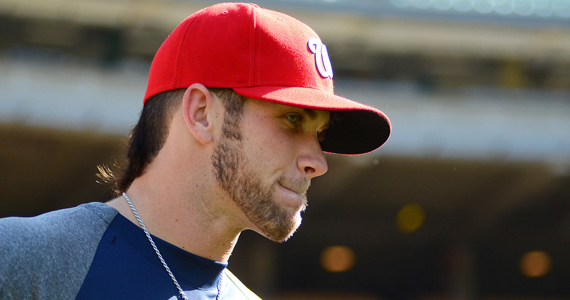 Before we get into how Harper did in his debut, I’d like to talk about Harper’s alleged maturity concerns. Because of a couple of incidents in the minors (getting thrown out of some games for arguing, and the infamous blown kiss to a pitcher after homering), some have labeled Harper as immature. To those people, I say this: It’s not that rare to find that someone is an immature douche when they’re 19 years old, rich, and extremely talented. It happens with lots of people, most of whom are not even rich or being dubbed as the future Alex Rodríguez of the baseball world. 19 year old kids are immature… get over it. Unfortunately for Harper, he has probably been inadvertently raised to be a bit of a douche because he’s been pampered his whole life due to his baseball talents (think J.D. 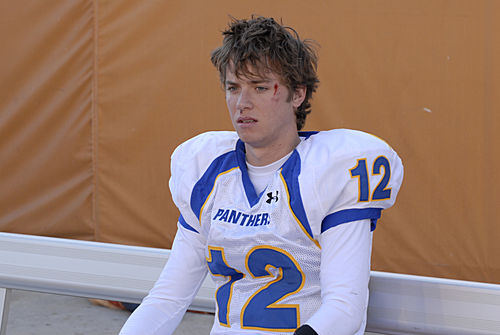 McCoy from Friday Night Lights). The problem will arise if he decides to blow kisses at the pitcher after his first major league home run. His next at bat, he’ll be taught not to do that again. Except this time, it won’t be Johnny Minorleagues throwing at him. It will be someone a whole lot better, and a whole lot meaner, who won’t be thinking about getting in trouble for breaking the wrist of the next Miguel Cabrera. If Harper is still has a problem with maturity and respect when he’s 22 or 23 years old, that’s when his development might be hindered. I think we should let the kid be 19 for a while, as long as he’s learning. Also, I am sure that there are enough good influences in the Nationals’ clubhouse to keep him in line. Ryan Zimmerman isn’t gonna put up with any crap from some 19-year-old kid, right? I made it a point to watch parts of his debut on Saturday (the fact that I have Stephen Strasburg on my fantasy team didn’t hurt either) to see what the kid looked like in a major league batter’s box. My initial impression was that he’s like the Lebron James of baseball. Not just because of his talent level, but because he looks like he’s already in his late 20s, despite being a teenager (ok Lebron has always looked 40, but you get the point). At 6’3 and 215 lbs, he looked like he could do some damage with the bat. Something that I really liked about his debut was the ground ball he hit to second base in his first major league at bat. For a guy who is supposed to think he’s the greatest thing since sliced bread, and allegedly has discipline problems, he ran really fast down to first base. That shows me that, somewhere in there, he really respects the game of baseball and his teammates. How many guys are going to bust it down the line on a grounder to second? Secondly, I noticed that he seemed very calm at the plate. I’m sure that, on the inside, his heart and brain were going a mile per minute, but he didn’t seem like he was trying to do too much with the bat. He got a pitch up in his second at bat and smacked it over Matt Kemp’s head for his first major league hit, and hit a fly ball the other way when the team just needed a run to take a late lead. He also showed off his cannon arm in the game, making a perfect throw from left field on a play at the plate (Wilson Ramos dropped the ball, or they would have been talking about that throw for weeks). So far, the kid is playing the game the right way. With the injuries to Rick Ankiel and Mike Morse, the nationals really need help in the outfield right now, and I think Harper will provide that if he keeps playing the way he played in his debut (and the game after). He has the potential to be a once in a generation type of ballplayer, and I’m excited to see what he’ll be able to do over the course of the season, and once he gets fully acclimated to this league. Maybe he’ll prove to everyone that concerns about his maturity are unfounded, maybe he won’t. Either way, he should give Nationals fans plenty to cheer about for a long time to come. In Boston, the media is comparing him to hometown hero Tony Conigliaro, who was just past his 19th birthday when he made his major league debut in 1964. Tony C. hit the very first he saw as a major leaguer for a home run, the first of 24 his rookie year.